Chest Workouts | 4 Exercises For a Bigger, Balanced Chest! Nothing epitomizes the manliness of a man than a big, round chest. To get such a chest that you can set a can of soda on, it takes work, consistency and big lifts accompanied with specialized tweaks to get your pecs growing. It will take more than just a big bench press number to get your chest to be second to none, so follow these tips, tricks and exercises to have that massive chest you’ve dreamed of. The chest is a fairly simply body part to train as it’s all pressing movements. It is made up primarily of the pectoralis major and accompanied by the Pectoralis minor and rotator cuff muscles. The rotator cuff muscles actually work to stabilize the shoulder joint during any pressing movements. The Pectoralis Major, (highlighted in red) can be described as having 2 different regions: The upper and lower chest. Everyone wants to build a bigger chest but jumping on the Chest Press machine or picking up a pair of dumbbells without properly preparing your muscles to train, you won’t receive the results visualised in your mind. First and foremost, if you have the rotator cuff strength of a kindergarten girl, you’re chest will never be up to par! Strengthening the rotator cuffs will allow for a better, correctly-performed pressing movement (e.g. bench press) whilst working towards avoiding shoulder injury. This will work supraspinatus rotator cuff muscle and allow for maximum torque within chest movements. a) Start by grabbing a dumbbell/setting up the cable machine to elbow height and stand a couple of feet away. c) Keeping your elbow in place, rotate your arm in a backwards motion until you can go no further. d) Hold the position for 1-2 seconds before returning to the starting position. Once your rotator cuff has been primed and ready to fire, we can proceed into the chest movements. I like to use dumbbells as opposed to barbells due to its increased range of motion as well as it forces you to stabilize and engage core as well to move in a straight plane. This will target the middle/outer portion of the chest. a) Begin by laying flat on a bench and lowering the weight down to lower portion of your sternum. b) Push the weight up while keeping elbows tight against core and making sure to keep hips down on bench. c) At the top of the movement, try to flex your chest to force as much blood as possible into area. d) Do not lock elbows out at top of movement for this takes tension of the chest and into the triceps. 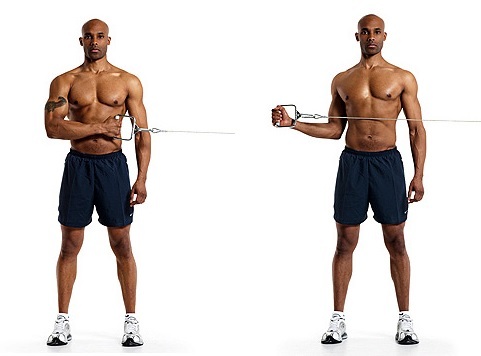 We now move on to working the upper/middle portion of the chest – this exercise also doubles up and hits the shoulders! Incline flyes are a great choice for anyone who suffers with back pain, due to the decreased chance of your back arching off the bench. Note: Contract as much as possible through the chest to ensure less concentration on the shoulders and more on building that chest! a) Start with an inclined bench and grabbing some dumbbells starting overhead. b) Lower your arms keeping your palms facing each other the entire time, while feeling the stretch in the outer part of your pecs. c) Then, press the weight up, keeping the elbows slightly bent at same angle throughout entirety of rep and at the top-squeezing your chest. d) The end movement should like you are trying to hug a big barrel with elbows slightly bent. Dips? Aren’t they an exercise for triceps? Correct, however – dips on a parallel dip bar are also considered an ultimate bodyweight Chest exercise that is underused and under appreciated. The last portion of the chest we need to hit in our workout is the lower chest, and dips will do just that! b) Begin the movement with arms slightly bent and then lean forward – this will take tension off triceps and force movement to activate chest. c) Inhale and begin to slowly lower yourself, holding your upper body at around a 30 degree angle – try and (very carefully) lean your arms out to the side to really dig for that Chest stretch. d) Dip right down to where elbows are bent at 90 degree angle and, exhaling, press back up, powering from the chest muscles – you’ll finish the move with elbows still slightly bent and chest flexed. TIP: Too easy? Try adding a weight belt with plates to hit the desired amount of reps while reaching failure. If this movement is too hard, try having a spotter help you with the movement – for an added push, increase your strength and power with some pre-workout! From now on, your training should focus on the squeeze and feel of the muscle being worked rather than the number on the side of dumbbell and plates on each side of the bar. True muscle building comes from lifting smart with weight you can control in a rep range of 8-12. Follow this routine and you’ll build a great base layer of muscle to continuously improve all-year round!